These Mandarin play-dates focus on Chinese language exploration and helping children to get familiar with traditional Chinese culture. We show kids traditional art, craft and food such as shadow-puppet plays, tea ceremonies, traditional music, and dance. We also read stories related to Chinese culture to kids. It is open to both native and non-native speakers. Parents are encouraged to stay with kids to experience the culture together. We offer after school group classes at private schools. If you wish to know the class schedule at your school, or ask your school to host the program, please contact us for details. 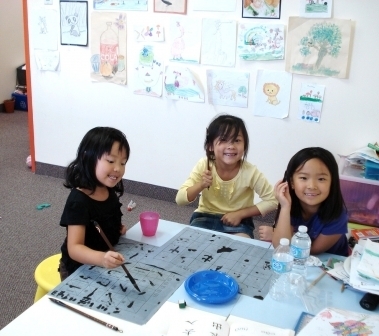 A great place for kids to learn Mandarin with little or no prior knowledge. Children will learn Mandarin (both speaking and writing characters) and Chinese culture. ​Camp runs from 9:00 am to 4:00 pm. Bring your own lunch. Details see main webpage. Learn Chinese history and culture. * No class on holiday. My sons really enjoy their weekly lesson with Julie. Even they are just doing 1 hour a week, their Chinese have improved greatly. In just 6 months, both of them have learned much more Chinese than one year of learning at the old weekend Chinese school (3 hours a week run by the school board). We appreciate the semi-private class which gives each child more focus. The teacher (Julie) is able to offer each child individualized help based on their needs. Julie's patience toward the boys is greatly appreciated. ---Linda W.
​My girls really love their class and look forward to seeing their teacher. The girls are also really enjoying Mandarin...in their last school they started to lose interested and now they are enjoying it again. Thank you! The girls like that they have workbooks and that they are visually appealing. I like how there is review of the lessons each week, but would also love to see some tests so that we can see where they are struggling and go from there. ---Tammie H.
Why learn Mandarin and what is important for non-native Chinese speaking kids? ​ Mandarin is the most widely-spoken language in the world. There are about 10 billion people speak Mandarin. With China's economic rise, Mandarin Chinese has become more popular in American schools for the last ten years. Maybe not every kid should learn Mandarin, but if you are considering having your children learn a second or third language, why not choose Mandarin? Is Mandarin hard to learn? Mandarin is not as hard you may think. Yes, it is a completely different writing system and each word has different intonations, but it is actually very simple in terms of the grammar and counting system. The Chinese characters, like Latin languages, also have "roots" (radicals). Once you know the system, it is very easy to remember new characters. There are many benefits of learning Chinese, but I will focus on what is important for non-Chinese kids to learn Mandarin. Once a child learns and masters the pinyin system, the kid should start learning Chinese Characters immediately. Children need to be able to recognize characters, learn the right stroke orders, and know how the characters are formed and what each character means. Children should start with image-like characters and then move on the combination characters. Understanding the meaning help students to learn the words easily and eventually learn the Chinese mentality. Students should hear and study Chinese stories for kids from the very beginning of their lessons. It is the best way for the kid to understand the Chinese culture. This will apply to any language learning. Students in many other countries are learning English, but not many students who speak fluent English understand the American culture. You may not have an engaging conversation with a native speaker if you don't know their stories, their TV shows and pop stars. Especially for young learners, learning the culture is probably more important than learning the language. Languages are most useful when you speak it, so young learners should practice a lot through mini-dialogues and min-dramas. This is also the fastest way to remember the correct sentence structure and develop correct grammar sense. Amelia: Hi. My name is Amelia Benke and I am 8 years old. Wellington: Hello! My name is Wellington Benke and I am 10 years old. Q. How long have you been learning Mandarin? Wellington: We have been learning Mandarin for 2 years now. Q. What do you enjoy the most about the language? Amelia: I like Chinese because it is fun and I get to learn new things. I think it sounds cool. Maybe when I am older, I can even teach other kids Chinese! Wellington: I like learning Chinese because it is so interesting. I love writing the characters. They can look tricky but they’re not so complicated if you divide them into parts and do them part by part. Q. What influenced your decision to study Mandarin? Amelia: The reason my brother and I decided to learn Chinese is because we thought it would be cool to learn. The characters look interesting, and are sometimes hard to write. Q. Where do your lessons take place? Wellington: We take lessons from the Golden Key Cultural Centre, a school in Mississauga, Ontario that helps people learn Mandarin. We have never actually been to the Golden Key because we live very far away, in British Columbia. So we do our lessons on Skype through video chat. We enjoy taking lessons because we can do them from home. Q. What is your favourite part about the lessons? Wellington: My favourite part is that while I’m doing my lessons, I can see my teacher, Joanna and she can see me, even though we are far away from each other. She makes the lessons fun by playing games like making me touch my ear or nose when she says the Chinese word for it. She also lets me watch Chinese videos that help me understand new words. Q. Do you find the language hard or easy to learn? Wellington: Even though Mandarin is a hard language to learn, we are finding it very fun and interesting. It is easy to learn Mandarin when the lessons involve lively conversations and stories. Q. Overall, what do you love learning the most? Amelia: I enjoy seeing maps of places in China, and learning about the different places. Someday, I want to go to China and see a panda bear! Wellington: I like learning about Chinese culture and about the country. I hope someday I can go to China and say, “I’ll have some noodles!” in Chinese. Noodles are my favourite Chinese food. I hope you can go to China too!